During the fighter competition of the mid 30's that saw the Bf-109 come to the fore, one of the other competitors was the Heinkel He-112. Though the aircraft was generally better in all areas to the 109, two factors were against it. First was that Heinkel was thought to be more of a bomber manufacturer than one who did fighters. Secondly, though the 112 was a super aircraft, the Bf-109 was less expensive to build and as still goes on today, the government will sacrifice a bit of quality to get more of a cheaper product. RS has produced a number of rather nice short run kits and this one on the He-112 is rather nicely done. Most of the kit is injected plastic with resin and photo etch being used to enhance the kit as much as anything else. 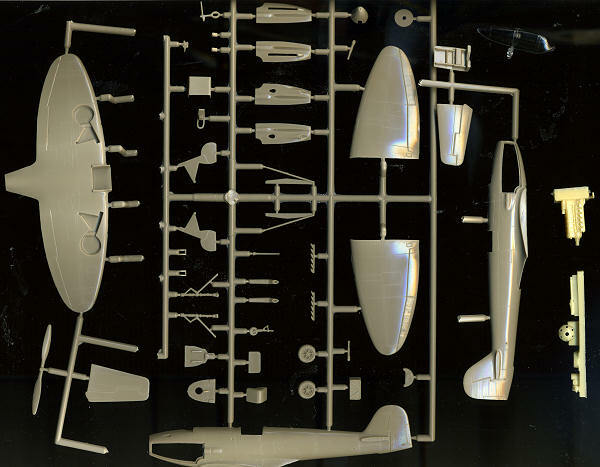 All of the resin parts, which are very nicely molded, are for th e engine, a component that one does not have to install to complete the kit. The equally well done photo etch fret is from Eduard and has a color instrument panel as well as gear doors, radiator screen and a number of smaller parts for the interior and exterior such as belts, oleo scissors and control actuating arms. Not all these photo etch parts are absolutely needed and, for instance, the gear doors are also part of the injected plastic sprue. Surface detailing on the plastic parts is very well done and there are optional engine covers for the B-1 or B-2 versions. One will have to use the markings guide to determine which one is to be used on the version you are b uilding. Speaking of which, the instructions are basically two small folded sheets. The parts layout and building instructions are on one side of one sheet, while the other sheet contains painting instructions for the seven markings options. Paint colors are by Agama and Humbrol references. 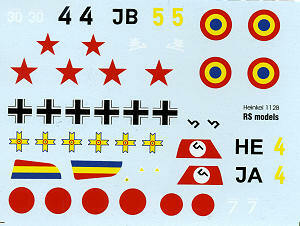 Two of the options are German JG 132 planes in a splinter camo of RLM 70/71/72. Next there are three Romanian planes. Two are in Green/Light Green over Light Blue with yellow noses and other Eastern Front markings. The third is a pre-war plane in overall light grey (RLM 63). Also in RLM 63 are a Japanese and a Soviet example. To be honest, real RLM 63 is a rather darkish green-grey, so perhaps these planes allegedly in RLM 63 are actually in Lufthansa Light Grey. The decals are nicely printed and look to be quite thin. The back of the box has a few photos of the planes, instrument panel and engine that are nice touches. If you really must have the Hungarian or Spanish versions, then there are separate boxings for those.